Stanley Herbert Torning - The Best Gramps in the WORLD!!! 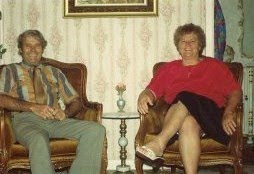 The picture above is a picture of my Grandpa and Grandma. The BEST Grandparents a person could ask for! I spoke about my Grandma before in a previous post. Grandma was a fantastic lady who sacrificed everything she had for others. Grandma and Grandpa were like two parts of one person. Grandma was the brains and Grandpa was the body. And Grandpa was just as amazing as Grandma. Grandma passed away on June 16th, 2001. I've missed her every day. After Grandma died, Grandpa's dementia, that had only been coming on slowly while Grandma was alive, started to take hold with a vengeance. Within three years he was living in a nursing home because he was unable to care for himself. The last few years have seen Grandpa gradually succumbing to the Alzheimer's, the only thing keeping him going? the fact that his body is so healthy. His mind had gone but the body kept on. Today, on the 8th December, 2009, my Grandpa passed away. In a small way it's a relief, as the life he was living by the end wasn't really a life at all. Now he can be free. He can be with Grandma again. I am going to miss him so much, and I am so thankful and grateful that such a wonderful man was my Grandfather. P.S Alzheimers is a horrible thing for a person and their family to go through. It's almost worse for the family of the person suffering in some ways. If you or someone you know needs support, please head to this website. You can also donate money to the Hazel Hawke Alzheimers Research and Care Fund at the website, to help provide support and care to those affected by Alzheimers and to help fund research into a cure/prevention. P.P.S. There may be a lack of posts this week (except for the scheduled weeklies) so my apologies, things are a little off-kilter at the moment. I feel for you! I've just recently gone through a similar thing... in reverse. My Granddad died in 96 and suffered Alzheimers for 10 years. My Nanna passed away on Friday the 13th last month of secondary cancer of the liver (she'd fought breast cancer 4 times previously). I miss both terribly, but it was especially hard to say goodbye to Nan - she was a fighter and just a rad person all round. I know that feeling of slight relief, mixed with grief all to well and my thoughts are with you! I'm so sorry for your loss. It's terribly hard to lose the ones we love, especially to such a dreadful disease. That's sad. It sounds like they were lucky to have each other. Too many people fear growing old but if you can do it with a real partner it's probably a great thing. And he had to live 8 years without her? I'm sure that's the hardest part.